We live in a world where you don’’t need to eat or drink, you cannot die or harm yourself, you can breathe underwater and you can fly? Add to this our ability to build things in mid-air, walls you can walk through, objects that disobey basic physics and we have the potential to create social spaces only limited by our imagination. 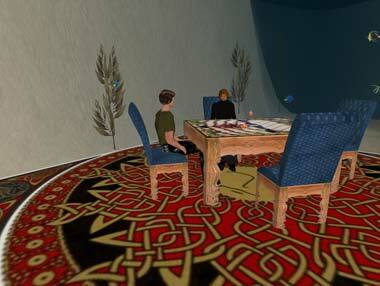 I have decided to take on solo, the task of completing the first phases of a sim, an Island we called Esperance. The build is truly started from scratch on behalf of the ‘‘real life’’ Australian Film TV and Radio School, where I currently work as Director of LAMP, outreaching into the Australian Industry – but also focussing on activating the internal school community. Given a blank canvas I have come face to face with the tensions that exist in creating back-to-back social and work-spaces, in a virtual world. The main tension is actually one persistent in second life – to be representational or to be original, to innovate or invent and to over-build or leave space. But to start with a broader question, given the flexibility mentioned above in Second Life why is there still such a high propensity of real world cloning taking place? Not just copying individual instances of architecture but dense populating communities. OK I know the way land is sold back-to-back in SL, that it is inevitable that it will get dense but even on islands our human nature drives us to build way too much. There are malls just like our real world ones, city streets and buildings with ceilings, windows and physical walls and endless roads and pavements so you can ‘‘walk’’ around. 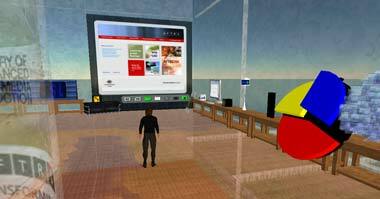 Yes it does seem remarkable that in Second Life many of the residential, social and commerce areas are just models of our real world spaces for our enhanced real world avatars to exist in. 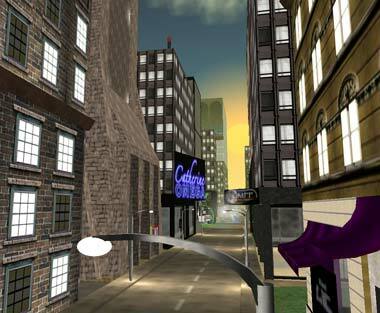 Some of the earliest builds like Midnight City (above) complete with New York police sirens and pneumatic drills, replicas of Amsterdam, endless Arabian palaces and several concrete University campuses abound. Why do we need the recognisable? Why is the recognisable not even extended slightly to include unique, never before seen features? OK there are a few but the mainland of SL is, at a rough guess, over 90% environments that can be built in the real world. We do need some recognisable areas to start from sure but why not extend and experiment. 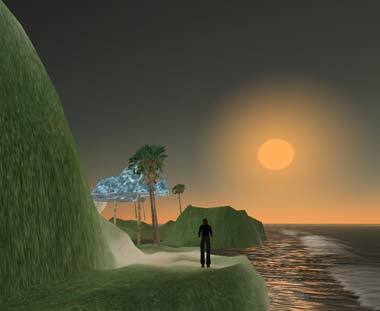 The areas I enjoy most in SL tend to be the enhanced naturalistic spaces such as The Lost Gardens of Apollo, the Underwater Caves at Rua or The Pot Healer Game on Numbakulla. So in designing the AFTRS island from ground up I had to balance the need for work (media production spaces) along with the need to socialise, play and relax. I knew this was going to be a never-ending, iterative organic process so I took the plunge and over one day two weeks ago effectively built what will be the foundation of the AFTRS Island (I have enhanced it last weekend and those are the images you see here). With a list of needs I decided to roughly consider the island as two broad areas, work and the play. I started a ground level literally with the terrain greyscale file. This allows me to terraform the whole island in one go using a simple 256 pixel square 13 layer raw graphics file, manipulated in photoshop. After five or so misses I got the basic landscape close to what I needed and have of course been tweaking on the ground ever since. I wanted a balance of flat, built up spaces and naturalistic, vertical play areas. That balance I believe is still being achieved, but will be an on-going journey, especially when staff and students start to get their building ‘‘legs’’. I did have the option to make the ground completely natural and build functional spaces in the sky but I believe work can be enhanced by being near the coast with crashing waves and natural sounds around you. To follow on from the start of this post I had a traditional tryptch of building options ‘– representations, enhanced representations and originals. The representational spaces included the main cinema/theatre (pic above) a smaller enclosed forty seat TV studio, a range of production backlot for film sets, and a few scattered dept. offices. The theatre took most time as I wanted something to hold up to one hundred in a screening situation and double as a multi-camera live shoot for theatrical and music performance. It is constantly evolving and getting close to a functional space. I built a ‘‘representational’’ sadly, new camera for all areas, and added AngryBeth’s great camera switching script that she gave to me a couple of weeks ago. The enhanced representations included a main AFTRS information, meeting tower and a range of naturalistic forest, coastal and mountain social spaces. The tower, which sits in the mid point of the island, would hold areas for visitors to see, interact with and find out about Australian Media plus a few permanent office-type areas. There was talk of building a replica of our new campus, but as this is still being designed and my reticence for the real world I suspect that will go away. For the main tower I wanted something that allowed views of the whole island at work, didn’’t feel claustraphobic and was easy to explore ‘– by flight as opposed to walking up long ramps everywhere. The picture on the right show some aspects that are still being developed, but the translucent, phantom walls and easy to access layers means we can keep developing upwards as departments and info needs come on stream. It takes some getting used to, avoiding walking through phantom walls as you will fall out of the building, but hey don’’t walk through walls. The central fly-up tube is proving interesting in tests as it requires some control over your ascent skills, slowing as you get to the floor of interest and flying through the wall. I may build this on the outside wall as people tend to keep falling back down the central tube as they explore each floor! The third build paradigm, the original spaces include some ground up designed rotating meeting pods which allow up to nine seated chatters, a breakout five way enclosure and a couple of underwater meeting spaces. I was surprised how sitting underwater with fish swimming around actually allowed one to focus far more than a boardroom, campground or simulated coffee shop. I am developing a growing range of experimental flying spaces, many slowly rotating but allow all users to focus on each other while providing a sense of change and space. I like meetings in NightSpys ‘‘Holodeck’’ that I have permanently out in the backlot areas, but as this is 360 views of our real world it breaks whatever fourth wall there already is in SL ‘– no I am developing more amorphous, soundscape and organic spaces that promote original thinking which I will cover in a future article. Finally back to the start it is worth pointing out the thinking behind the layout of the island. Even though the island is effectively a series of smaller ones, as I wanted water to be only a few tens of meters from anywhere and no built up canals, it was important to make the whole area walkable for some game applications. I have been to many sims and not got a sense of real space as, and this contradicts what I said earlier, you are blocked from walking and only walking. It is possible to circumnavigate Esperance by foot and I have designed quite a few hidden valleys and caverns for simple quest games, especially around the LAMP (Laboratory for Advanced Media Production ‘– which I direct) mountain, breakout areas. There are many other aspects that one must consider when developing the areas around the island and these must fall into the mood category. The vegetation, environmental sounds or music, local props (waterfalls, fires) and of course thought about the composition and delineation of each space and how much it is removed from other spaces but still provide some island continuity. It has been fun starting this process from scratch and I am finding that that all the AFTRS students who have been initiated into the environment are getting very excited about the many and various aspects of it. 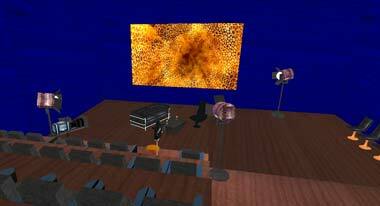 I am excited to know what those being trained professionally in the craft of TV and film making (many who go on to win Oscars) can do with this environment, I wonder also how representational (like the TV studio set above) they will need it to be to create wonderful machinima rich with story. There are many other things we have planned for the world including script and story development through improvisation and indentity experimentation, set design, collaborative development of interactive 3D objects and environments, game narrative creation and sharing/hosting screening festivals, presentations and learning events – plus all the awareness raising around Australia’s premier media academy. 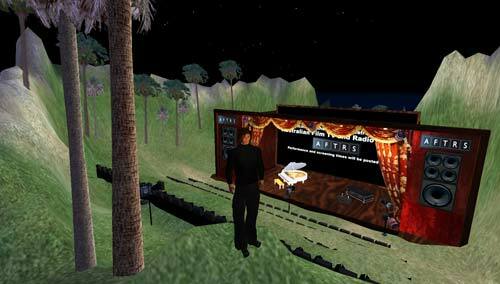 As in any new form there are the early entrants who pioneer but then quickly those who can communicate narrative (linear and interactive) at a much higher level are tempted in when it reaches a level of maturity, second life is very close to being there. 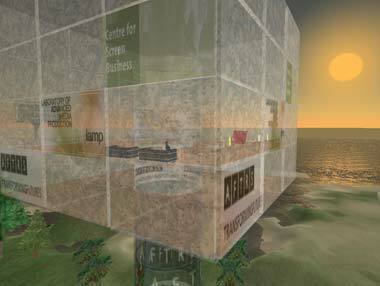 I have tried so far in the initial phases to not borrow too heavily on either the real world or existing areas in SL. 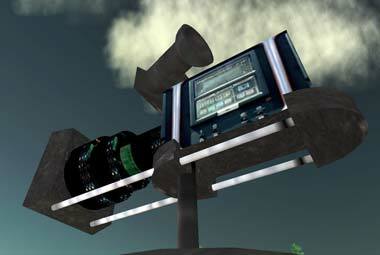 If you are any of the twelve thousand land owners in SL you will know how satisfying but fiddly it can be creating the spaces in our virtual world, the constant tweaking, going through endless modifications and alternate builds. One thing should pervade your thinking though, try to fight the need to fill in all the spaces and make the virtual world as over-built as our real one. If you want to see more images and the build in progress visit this photo journal on the LAMP site.